(Bloomberg) -- Cory Booker attacked President Donald Trump and urged social and economic justice -- and legalized marijuana -- to hometown supporters on Saturday as he tries to energize a presidential campaign that’s yet to catch fire. He also warned of a “box-checking competition” as Democratic candidates look for ways to stand out in a crowded field looking to take on Trump in 2020. 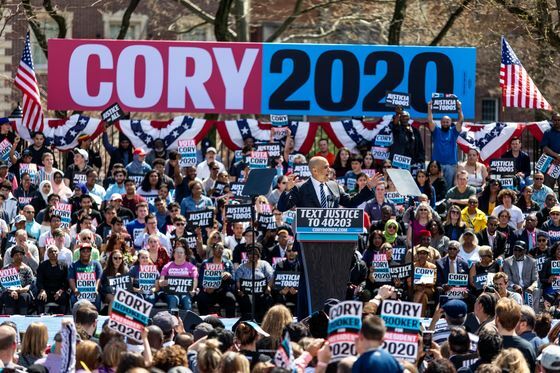 Booker told about 4,000 supporters at a rally in Newark, where he served as mayor before being elected to the U.S. Senate, that clean water, environmental justice, jobs and better schools are “urgent” issues that will be central to his campaign. He pointedly criticized the Trump administration’s policies. “We can’t wait when this administration is throwing children fleeing violence into cages, banning Muslims from entering the nation founded on religious liberty, and preventing brave transgender Americans from serving the country they love,” Booker said. Booker has fallen behind many of his Democratic competitors in fundraising and early polling heading into the 2020 primary season. Saturday’s event kicks off a multi-state tour in a bid to gain a foothold at the top tier of candidates. During the rally -- part street festival with face-painting and food trucks -- in the city where Booker rose to prominence as mayor, he also said he’ll push for reproductive rights and for ways to attack income inequality. Booker plans to spend the next two weeks on the road, making stops in Iowa, Georgia and Nevada -- three states with contests in the pivotal first month of caucuses and primaries for the 2020 Democratic nomination. Booker, one of the most popular politicians in his home state, has yet to capture the same level of intensity as other contenders at the top of the pack of 17 declared Democrats. Four of his senate colleagues -- Bernie Sanders, Kamala Harris, Elizabeth Warren and Amy Klobuchar -- exceeded Booker’s $5 million fundraising haul for the first three months of the year, as did former Texas Representative Beto O’Rourke and South Bend, Indiana, Mayor Pete Buttigieg. Booker, 49, is scheduled to spend Monday and Tuesday in western Iowa, where the “Justice For All” tour will focus on his plans to lift working families and communities he says have been left out of the decade-long economic expansion, or disproportionately harmed by the justice system. Just 3 percent of the state’s voters named Booker as their first choice, compared with 27 percent favoring former Vice President Joe Biden, who’s expected to announce his campaign this month, and the 16 percent who cited Sanders, a self-described democratic socialist from Vermont. Buttigieg, who’s holding a rally Sunday in his hometown, rounded out the top three with support from 9 percent of those surveyed by Monmouth. Patrick Murray, head of the Monmouth poll, said Booker’s challenge is two-fold: find an issue to “own,” while remaining viable for the long haul in a crowded field. O’Rourke enjoyed a flood of media attention following his strong showing against Republican Ted Cruz in the 2018 Texas Senate race. Buttigieg is the fresh face with an intriguing biography. Meanwhile, past leading members of the party such as Senator Elizabeth Warren of Massachusetts have also struggled to stand out. Murray chalked up support for Biden and Sanders to name recognition for Barack Obama’s second in command and the runner-up in the 2016 Democratic primary, respectively. Since Booker launched his campaign in February, he’s offered an upbeat message that contrasts with sharp attacks on Trump by some other Democratic hopefuls as well as top leaders in the energized progressive wing of the party. But Booker has also faced a challenge in generating the kind of enthusiasm from the left that’s lifted some of his rivals, particularly Sanders. That begs the question of whether his broadly positive campaign is what Democratic primary voters are looking for this time.